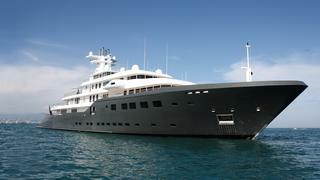 Black Pearl is the world's most advanced superyacht, offering true zero-emissions cruising, which is unheard of on a boat of her scope and size. The yacht's controllable pitch propellers feed power back into the ship via a pair of shaft generators, providing enough power to support the yacht's hotel load. The owner's brief for the 106.7 metre sailing superyacht from Oceanco included building a "zero impact" yacht. As was revealed in the full feature in Boat International's June issue, the owner wanted to prove that it was possible to not be dependent on consuming natural resources. Energy is saved at every turn, from the HVAC system to her advanced DynaRig sails that allow Black Pearl to take advantage of the eco-friendly natural resource of the wind. Black Pearl also will only have reusable water bottles on board to prevent needless waste from being created. To hear more from the designers behind some of the world's top eco-friendly superyachts, as well as leading marine scientists and environmental campaigners, join us at the Ocean Talks, hosted by Boat International Media in London on 13 June. Register your attendance for the Ocean Talks here. Black Pearl is the world's most advanced superyacht, offering true zero-emissions cruising, which is unheard of on a boat of her scope and size. The yacht's controllable pitch propellers feed power back into the ship via a pair of shaft generators, providing enough power to support the yacht's hotel load. 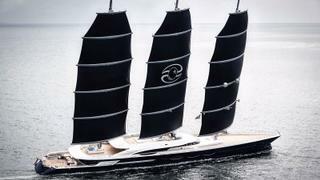 The owner's brief for the 106.7 metre sailing superyacht from Oceanco included building a "zero impact" yacht. As was revealed in the full feature in Boat International's June issue, the owner wanted to prove that it was possible to not be dependent on consuming natural resources. Energy is saved at every turn, from the HVAC system to her advanced DynaRig sails that allow Black Pearl to take advantage of the eco-friendly natural resource of the wind. Black Pearl also will only have reusable water bottles on board to prevent needless waste from being created. To hear more from the designers behind some of the world's top eco-friendly superyachts, as well as leading marine scientists and environmental campaigners, join us at the Ocean Talks, hosted by Boat International Media in London on 13 June. Register your attendance for the Ocean Talks here. 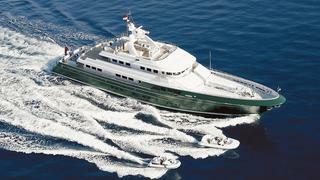 It's not just her seafoam exterior that makes 83.5 metre Feadship yacht Savannah a green machine. This 2015 launch uses the Dutch yard's pioneering Breathe propulsion system - which allows for five different operation modes from diesel and diesel-electric combinations to fully electric. Power comes from a 30-tonne lithium-ion battery bank capable of holding a million watts of electricity. But even in diesel mode, Savannah is highly efficient, with 30 per cent lower fuel consumption than her contemporaries thanks to her dynamic hull shape and steep entrance angle. 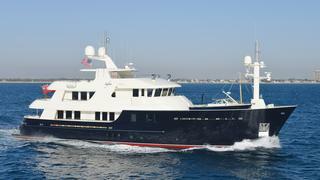 It's not just her seafoam exterior that makes 83.5 metre Feadship yacht Savannah a green machine. This 2015 launch uses the Dutch yard's pioneering Breathe propulsion system - which allows for five different operation modes from diesel and diesel-electric combinations to fully electric. Power comes from a 30-tonne lithium-ion battery bank capable of holding a million watts of electricity. But even in diesel mode, Savannah is highly efficient, with 30 per cent lower fuel consumption than her contemporaries thanks to her dynamic hull shape and steep entrance angle. 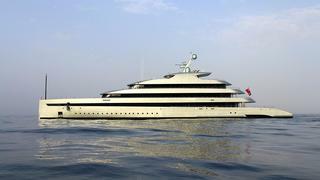 The first yacht fitted with Azipods, this 90 metre Lürssen, originally known as Air, has exceptionally low emissions. Ice's diesel-electric generators supply power to two azimuth thrusters, which have the added benefit of giving a comfortable, vibration-free ride. Not only can this 39.3 metre Newcastle run on 15 per cent biodiesel, but every aspect of Safira's interior also comes from reclaimed, recycled or remnant materials – all without sacrificing luxury. 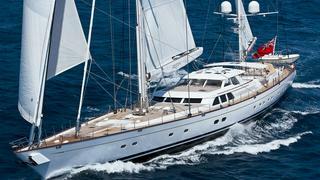 This 40 metre Holland Jachtbouw is the first J Class to use diesel-electric propulsion. Rainbow's batteries can be charged while sailing and she will cruise in battery-only mode for up to three hours. There’s a lot of green in that pot of gold! Beyond her olive-coloured hull the 44.8 metre Cheoy Lee Dorothea III has a single engine and thruster/backup power arrangement that results in low fuel consumption. Beyond her olive-coloured hull the 44.8 metre Cheoy LeeDorothea III has a single engine and thruster/backup power arrangement that results in low fuel consumption. 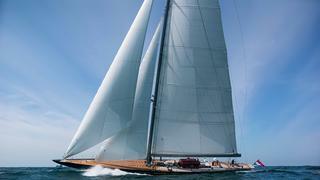 This 41.2 metre sailing boat from Concorde Yachts leaves nothing in her wake. Mirabella III's driving range uses biodegradable golf balls that turn into fish food, and the grey water treatment is state-of-the-art. She also collects ocean data to help with conservation studies. This 58 metre Royal Huisman is the world’s first hybrid superyacht with an electro-mechanical propulsion system that runs on rechargeable batteries. Ethereal's systems can run for an extended period on its stored energy, while lighting and appliances are energy-efficient.